Want to be notified of new releases in hozza/Personal-Finance-Net-Worth-Tracker? A simple to use community-driven advanced spreadsheet (Google Sheets/Excel) for personal finance management, net worth tracking, general money management, financial goals and FIRE (Financial Independence Retire Early). Grown from the knowledge and interests of various Reddit money-based sub-reddits. Designed for British Pounds in the UK (GBP£) - but I'm sure it could work for other currencies/countries too. Make sure to check for new versions as they may include bug fixes, improvements and new features! Where? Links: Project Home GitHub, Help @benhoskins64 Twitter, Donations, Discussions at Reddit. Extra information in the Wiki. Emergency Fund KPI, keep track of your disaster fund/buffer. 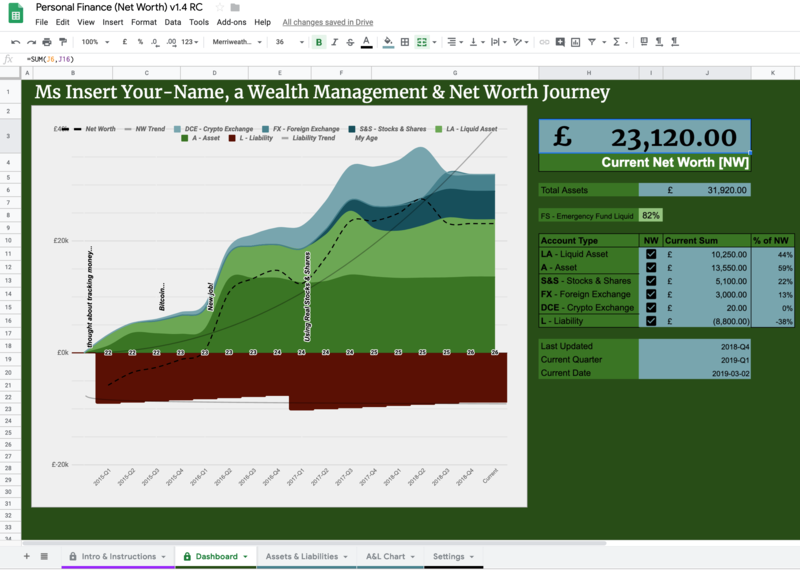 Networth Tracking, keep track of assets and liabilities, visualise trends and growth/loss. After looking around online for something suitable to track personal finance, and seeing the people of Reddit using their own various spreadsheets (r/FinancialIndependence, r/FireUK, r/PersonalFinance, r/UKPersonalFinance) - So I decided to put this spreadsheet together... I'm a programmer not a financial advisor and wanted a better way to manage personal finances, but don't have the time or capital to put together a full web-app just yet. This spreadsheet is free to use for personal use (at your own peril! ), the more people use it and provide feedback the better we can make it. Please do not sell or redistribute this spreadsheet/work or claim as your own etc. Refer people to this GitHub page so they can join in and help improve it too! GitHub is a place where users can donate their time and ideas, open 'issues' with feedback & questions, and where like-minded people can help develop the project by; fork/commit/pull-request their edits/improvements. I'll do my best to help users with any basic questions on Twitter, if it's a bigger problem than expected, or a feature request it's probably best on GitHub in the 'issues' section. Any donationed amount is greatly welcomed! Just buy me a 'thanks coffee', anything you feel it's worth, or absolutely nothing at all. 2019-03-02 v1.4 Made first public release copy and mentioned on r/UKPersonalFinance. 2019-01-06	v1.2	Added settings, fixes and Intro tab. 2018-08-01	v1.1	Improved graph, formulas & ease of use. 2018-07-01	v0	So how does this work.